In our fifth 8-inch Windows Tablet review we’re taking a look at the Acer Iconia W4. Acer were the first to bring an 8-inch Windows 8 tablet to the market but the W3 really wasn’t at all an impressive device. The W4, however, looks a whole lot better and performs a whole lot better thanks to the upgrade from Clovertrail to Baytrail. 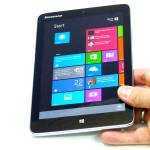 We’ve also got 3G on board which makes it one of the first 8-inch Windows tablets to have the feature. Read-on for the full Acer Iconia W4-821P 3G 32GB review. Specifications, Images, links, videos, comments and more information can always be found through our database on the Acer Iconia W4 information page. We have the 32GB model here which comes with 2GB RAM. In the box you’ll find the charger and charger cable along with a microUSB to USB host adaptor. None of the other 8-inch Windows tablets come with this adaptor. 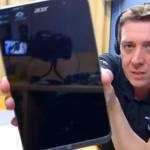 Acer W4 unboxing and overview video. 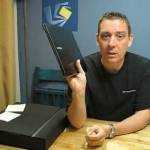 Our unboxing and overview video is available here. Where the Dell Venue 8 Pro and Lenovo Miix 2 8 have an attractive build, the Acer has more functional look. It’s thicker, has more ports and buttons and a slightly raised screen. There are advantages related to all those features but weight is not one of them. 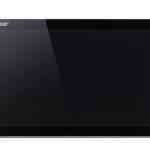 At 430 grams / 15.2 Oz this is one of the heaviest of the 8-inch Windows tablets. The additional HDMI port puts it inline with the Toshiba Encore WT8 as one of the more desktop-friendly devices and one that you can get some real value from the included Microsoft Office package with. Admittedly this won’t be an advantage to many owners but we must not forget that these 8-inch Windows tablets are the cheapest way to get and run Microsoft Office Home and Student on a new PC. More attractive to the average user is the larger battery. 19Wh is up there with the best. Detailed battery life report below. One note for people wanting to dock the unit via USB: Portrait mode docking is difficult due to the USB port placement on the bottom of the device. The HDMI port is on the right though so screen and Bluetooth keyboard and mouse is possible. Fit and finish of the plastics around the device seems to be OK although the plastic looks like it might scratch easily. Having said that, this demo model was in very good condition. 3G (HSPA+ 21Mbps max download) with Micro-SIM card slot. Camera The 5MP auto-focus rear camera is nothing special. A front-facing camera has low-light performance good enough for video chats. GPS. A GNSS GPS receiver is included in this model. Security: As with other Baytrail-T tablets there’s full-disk Bitlocker encryption available when you use a Microsoft Live account to log into the device (Encryption keys are held in your MS account.) Secure boot is standard and we haven’t yet investigated any boot/BIOS settings that might disable this. We have not checked the BIOS for user configurable Secure-Boot and password options. Miracast: This wireless display technology is available in all the 8-inch Windows tablets and can be used to project a screen or extended screen in FullHD to a display with Miracast capability or an attached Miracast receiver. Demo video here. Miracast receivers can be bought for as low as $25 now. Two matched Bluetooth keyboard options exist for the Acer Iconia W4. You can see these in a video here. Specifications, Images, links, videos, comments and more information can always be found through our database on the Acer Iconia W4 information page. Compared to the screen on the old W3, the screen on the W4 is in a different league. 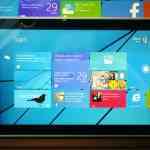 In fact, we think it’s one of the best screens we’ve seen on a Windows 8 tablet. The Dell Venue 8 Pro has it beat but it’s on par, if not better than the Lenovo Miix 2 which is the next-best. Viewing angles are great and brightness is good. We noticed an occasional flicker, maybe once every minute or so, that occurs in low brightness levels and a slightly shaded band towards the top of the screen in portrait mode. The band is not something we would worry about (and only found after close scrutiny.) The flicker could be related to the non-standard build we’re testing but be aware of it if you buy one. The weight of 430 grams is noticeable, as is the thickness but despite that we found it comfortable to use. There are no sharp edges around the device and the power key is tucked away nicely on top in portrait mode. We liked the feel of the mechanical windows button. As for speed and power we didn’t notice any differences to the other devices which is not surprising as technically, these 8-inch Windows tablets on Baytrail-T (Atom Z3740) are all very similar. Speaker ports (stereo) were just OK. The mono speaker of the Dell Venue 8 Pro is better. In terms of software, every time we test a Windows 8 device the range of modern/RT apps gets better. This time round we’re testing after the announcement of Windows 8.1 Update which will be available a day after this review is published. Google Plus, Drive, Music and other Google services aren’t that easy to use on the OS yet but we’re hoping that Windows 8, or maybe 9, reaches a point were it makes sense for Google to support it and port their apps over. As yet though, there’s very little Google support. Desktop usage is, as with other 8-inch tablets, a little difficult and on the Acer W4 we didn’t feel that the touchscreen was as responsive to our finger when trying to hit small Windows buttons. Closing a full-screen app, for example, often required multiple attempts. The MicroSD card slot and SIM card slot (micro) are not covered. The rear camera is an auto or touch-focus 5MP unit without LED lamp and the front is a simple 1MP cam that is actually OK for indoor Skype sessions. Neither have high quality optics. Two sample images are shown below and you can see a lot of grain on the indoor image. The 5MP cam is recommended for bright outdoor images only. Images are 2560×1920 (5MP) and are Geo-tagged. Toshiba Encore WT8 Unbox, Overview and Tests (Video.) Yes, you can say UMPC. The tablets still aren’t as fast in webbrowsing benchmarks as a desktop Pc. With firefox 20 I get 2750 in peacekeeper and 132ms in Sunspider. So thats about 4-5x faster than the tablets. Does only the 3G have GPS included? Or is GPS also available on the non-3G version? Does this connect to WiFi automatically while it’s still in Connected Standby/InstantGo? I have an older Clover Trail tablet and like using it for Skype but it never connects to WiFi access points as they become available. When I get into range of a known access point, I have to wake up the tablet using the power or Windows button for it to actually detect and connect to WiFi. 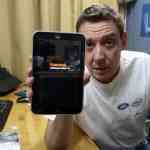 As for this tablet, I like the 3G and bigger battery. I was hoping companies like Dell and Lenovo would provide more configure to order (CTO) options when ordering from their site to add a digitizer, extended battery, better screen, WWAN, USB 3.0, etc. Too bad even these companies well known for allowing you to customize almost everything in your device aren’t doing it for their 8″ tablets. I guess the costs to allow such CTO options would drive up the retail price too high for the entire range. Does a Task Scheduler task set to wake up the device to run work on this? I have a Clover Trail tablet and I have a task that downloads some stuff from my NAS to my tablet every night. It’s set to wake up the tablet and run. However, it never wakes up the tablet. It finally starts the task when I manually wake the tablet in the morning. Is this how Connected Standby is supposed to work or is it my tablet? If this is because it’s a “desktop” app then does anyone know of a Windows Store app that can wake up the tablet to run tasks or even run them while still in Connected Standby? In particular, I want it to connect to my NAS via SMB and download a directory to my tablet. Any existing files will be overwritten.